When I can't endure the sun I flee into the shade. To no place I'd rather run Than solitude for aid. Let go of your limits, of what has become comfortable, of what you have thought you were, who you thought you should be. 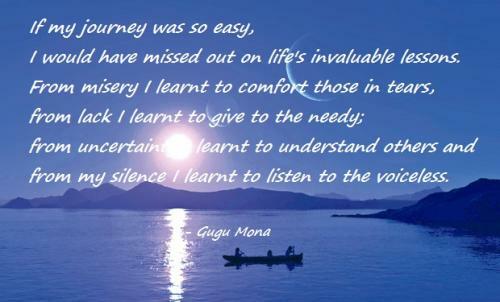 If my journey was so easy, I would have missed out on life's invaluable lessons. From misery I learnt to comfort those in tears, from lack I learnt to give to the needy; from uncertainty I learnt to understand others and from my silence I learnt to listen to the voiceless. As the moon gives Light at night as the sunshine energizes through the day, we seek thy comfort so lovingly To close my eyes and fall asleep in the garden of heaven where there is nothing but Love and peace. Prayer sustains us when all is lost. The moment he wraps you in his arms and pulls you in closer right before you both fall asleep. I know why hugs feel so good. It's because two hearts are never closer than when to people hug. I promise to be there when you need me, I promise to protect you with my ife, I promise to wipe your tears when they fall and I promise to keep you, not for the rest of my life but for the rest of yours because you are my everything. I will always be there for you until the very end, wiping all your tears away, being your best friend, and a companion for the life. Sometimes you have to step out of your comfort zone to build your understanding of who you are where you are going. Comfort is the feeling of being at ease. Comfort is not something that you easily get. 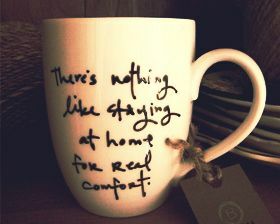 Comfort is a purely relative term, can be associated with several things. Frank A. Clark has rightly said, "We find comfort among those who agree with us, grow among those who don't". You feel comfortable when you are with like-minded people, people who have similar mindset or people with whom your frequency matches. But, there are people who differ with you on several issues. You can never feel comfortable in their company. But, this clash of opinions and thoughts is bound to happen because each of us is a completely unique creation of God and will definitely have a different viewpoint on each issue. This helps us to grow, because when opinions clash, you tend to discover the positive as well as the negative aspects of anything. So, blend even with those people who are not like-minded.